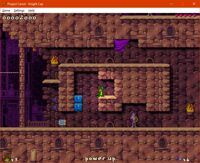 Project Carrot is a clone of the 1998 Windows and Mac video game Jazz Jackrabbit 2 by Epic MegaGames that aims to replicate the original game in spirit and functionality while embracing modern design choices and attempting to be extensible on its later stages. Originally started in 2013, Project Carrot was in works for about half a year before its development first slowed down and ultimately ground to a halt for a good while. In 2016, development resumed once again. 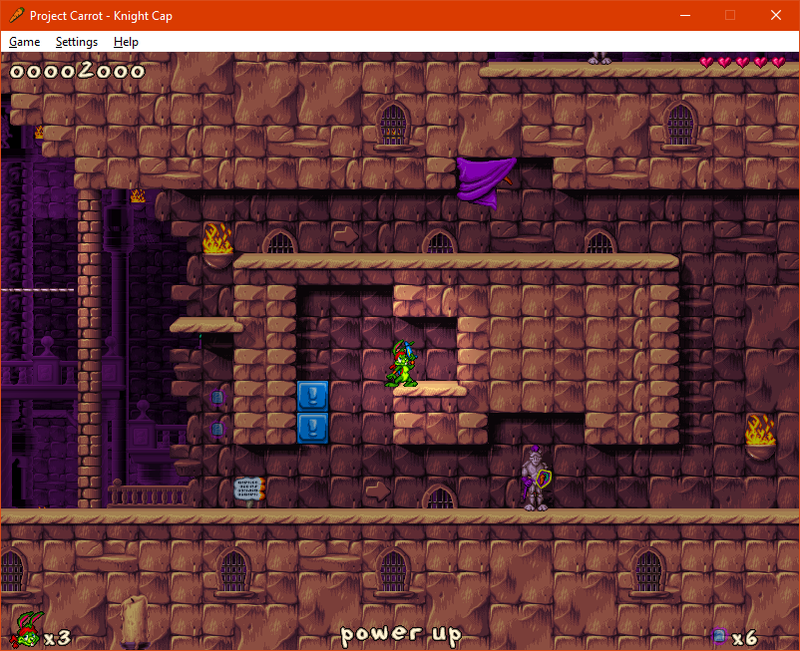 Up to this point, Project Carrot has been entirely a single person project. 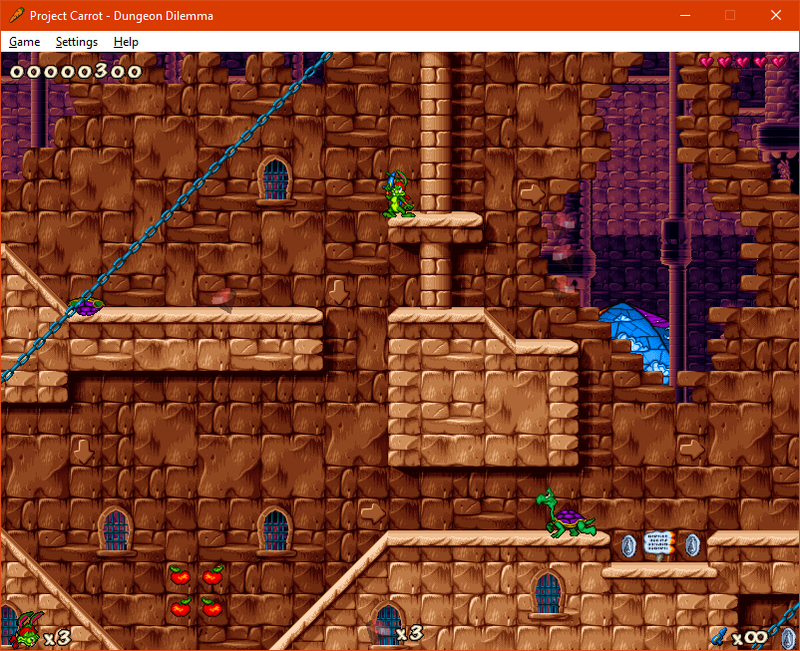 The Project Carrot family comprises of the main game and several utilities that are more or less essential for running it. 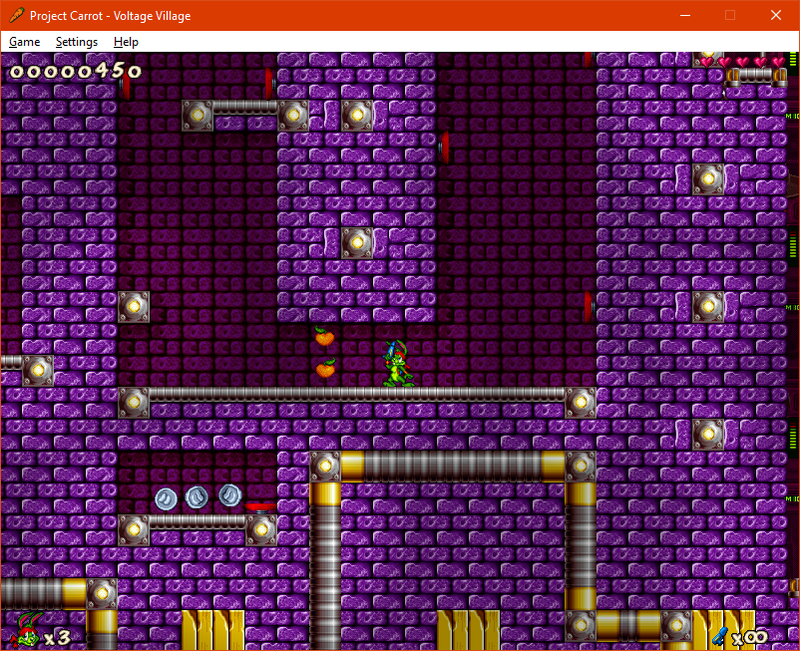 Project Carrot Anim Extractor (PCAE) is used to extract the required graphic and sound resources from the original game files, while Project Carrot Level Converter (PCLC) and Project Carrot Tileset Converter (PCTC) convert .j2l and .j2t level and tileset files to Project Carrot's native formats. 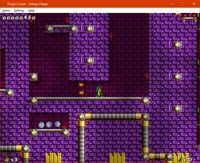 Additionally, a native level editor, Carrot Creator, has been planned. 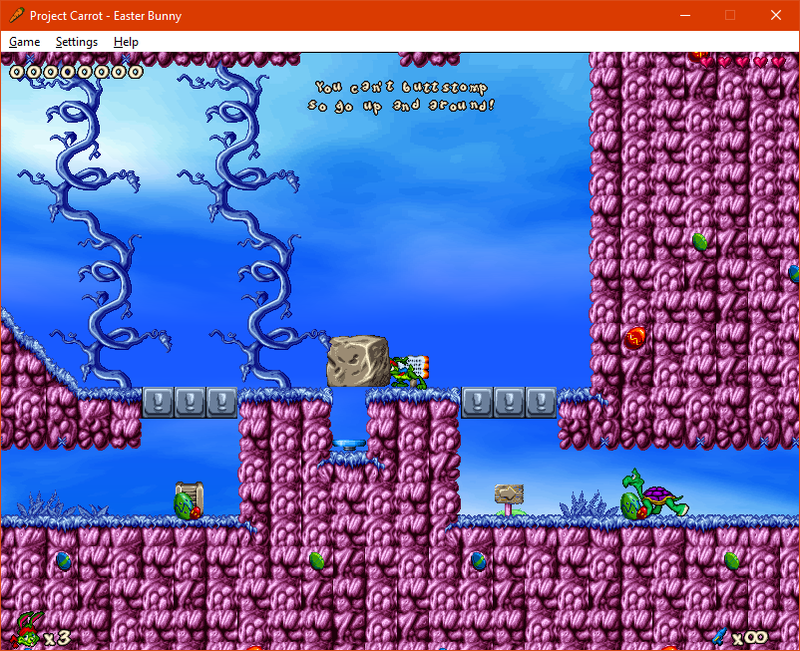 December 2016 – Covers changes between May 2016 and October 2016, including features such as the lighting system, positional sound, bonus warps, the base for the Freezer weapon, and a number of other newly implemented events. Voiceover and subtitles available. May 2016 – Covers changes between October 2013 and early 2014 as well as some bits in the early 2016. 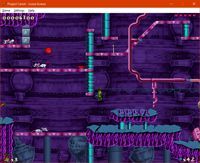 These include improved layer rendering; level traversing events such as springs, platforms, floats, tubes and hooks; Sugar Rush; collapsible scenery; pushable boxes; and significant performance improvements. Voiceover and subtitles available. 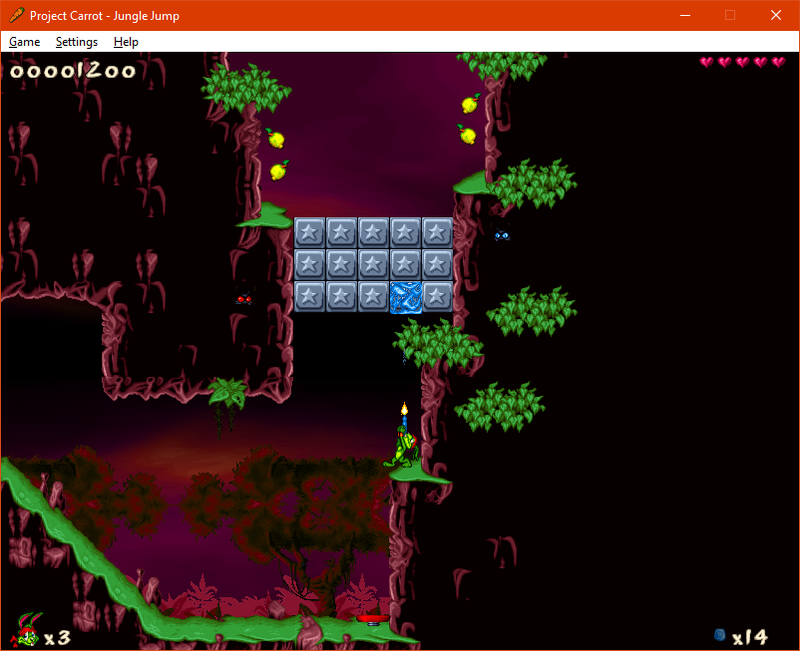 October 2013 – Major new features include a main menu prototype, copter ears, destructible scenery, next level mechanics, and improvements to Bouncer. Annotation-based subtitles only. May 2013 – The initial introduction, and as such, everything included was shown for the first time. Annotation-based subtitles only. The following binaries for different Project Carrot components are available. At the moment, only Windows systems from Vista and above are supported. 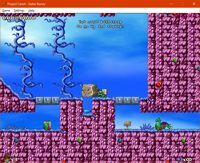 If you are unsure which version you should download, pick the 64-bit one; 32-bit builds are primarily provided for compatibility with very old or low-end systems. 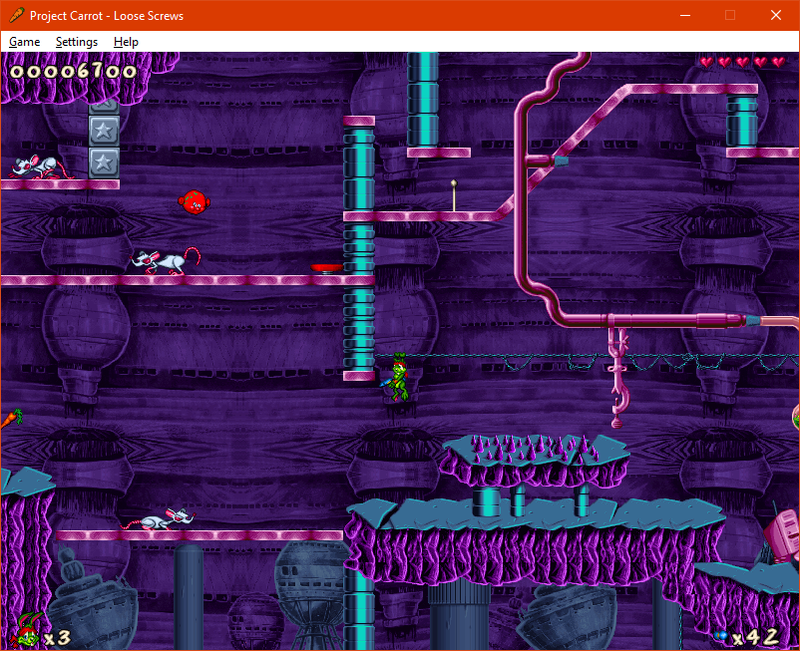 Project Carrot requires a fairly modern graphics card with shader support and a minimum supported texture size of 4096×4096 pixels. In 2016, this should only rule out low-end cards that are several generations behind. It does mean that you cannot run Project Carrot in certain contexts, like through Remote Desktop, though. ATTENTION: All of the listed binaries rely on the common runtime libraries and the linked Visual C++ redistributable! If you have not yet installed the redistributable package before, do so. For the library package, extract it in the same folder as the binaries themselves to be able to run them. 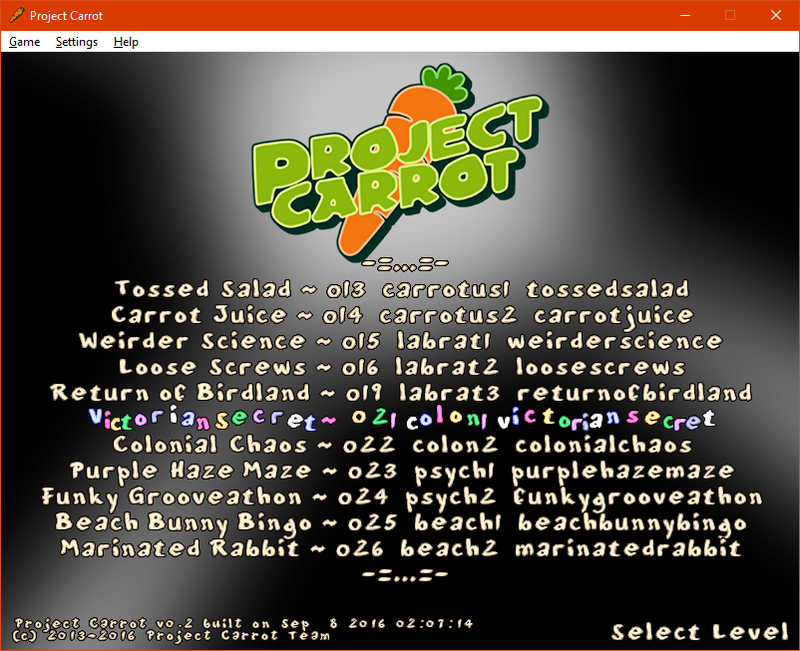 The source code for Project Carrot is available at its GitHub repository. The readme file for the repository details the requirements for compiling the game yourself. GitHub also hosts the source code for PCAE, PCLC, and PCTC. 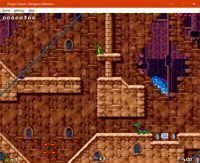 Project Carrot projects are built on Qt, a comprehensive framework for a wide array of software; SFML, an easy-to-use yet still efficient multimedia library; and BASS, a powerful audio engine. Each of these is available to all three major platforms — Windows, macOS, and Linux — making it possible to compile and run Project Carrot on each of them. Due to the currently volatile nature of the project structure, third-party contributions are discouraged at this time. This may change on a later date. Project Carrot and its sister projects are each licensed under the MIT License. What this means in practice is that you are free to do whatever you like with the source code or the compiled binaries, at your own risk and discretion, as long as the original copyright message and licensing information is kept intact. However, please observe and understand the following terms on the licensing of the third-party libraries. Qt is licensed under the GNU Lesser General Public License v3. The source code for Qt is available on their website. Commercial licensing is also available separately. 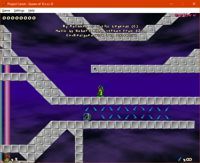 SFML is licensed under the zlib/libpng license and is free for any use. BASS is free to use for non-commercial projects only; commercial use of BASS requires a separate license. BASS FX is free to use in any kind of software, but a donation to the author is suggested if used in commercial context. Jazz Jackrabbit 2 still has an active community over at Jazz 2 Online, so please go give them a visit. On their site you can also find the JJ2+ patch, which adds a slew of new features into the original game, including full-fledged scripting support. Finally, Project Carrot also has a discussion thread on their forums if you wish to provide feedback. If the classic Jazz Jackrabbit is your cup of tea, you might be interested in OpenJazz by Alister Thomson. If a different approach to JJ2 interests you instead, also check out this UE4 project. 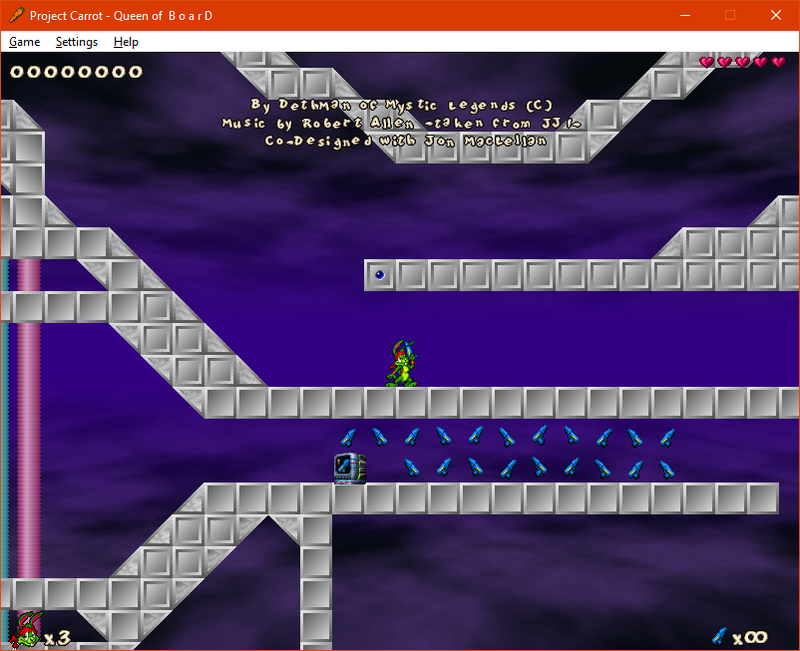 As for editing Jazz 2 levels with a modern interface, see DJazz's WebJCS.